American Cruise Lines announced on Friday that its new cruise ship American Constellation has left the shipyard with construction complete ahead of schedule for the inaugural season. Friday’s video can be found here. Earlier this year, when it became clear the ship would be completed ahead of schedule American added two Chesapeake Bay cruises to the beginning of the inaugural season, one on May 6 and the other May 13. Both cruises have already sold out. 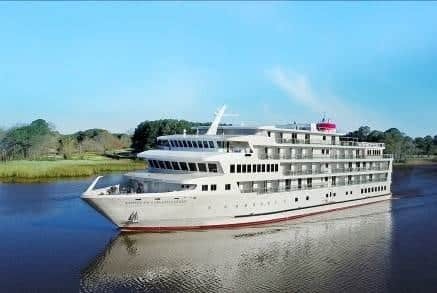 American Constellation will also be running American’s new Grand New England itinerary, with the official inaugural cruise celebration set for May 21. American is actively pursuing its new build program. The newly-named American Constitution is also ahead of schedule and is now available for booking. Along with its two new coastal ships, American Cruise Lines recently announced it has begun construction on a fleet of 5 modern riverboats. American Cruise Lines, the largest U.S. cruise line, is committed to continuous growth through an innovative ship building program that elevates the standard of cruising in America. The line is the leader in the US with more than 35 itineraries ranging from 4 to 21-nights in length, which visit the Pacific Northwest, Alaska, New England, the Southeast and the Mississippi River. The line has been continuously recognized for its new ships and for providing superb service to guests and travel agents before, during, and after a cruise.